Sustainability is the next frontier in beauty, or so believes Linda Wells, chief creative executive at Revlon. Compared to other beauty trends, “it’s going to be harder and more expensive” said Wells at last week’s Beauty X Summit in Los Angeles. And we certainly agree. 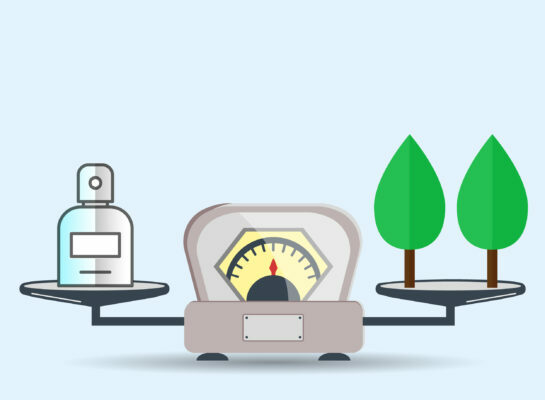 Sustainability is a worthy and necessary goal in cosmetics, but it can be hard to negotiate the truth that natural and organic ingredients don’t always add up to an automatically sustainable product. They don’t always go hand in hand. Let’s work through how this can be the case, how to combine business needs with sustainability goals, and what we can do to link these more closely together. When thinking about sustainability and your brand, there are three main areas to consider. There is your own personal sustainability — what you put on and in your body, how you manage wellness, and your role in the world. There’s the sustainability of your company and that of the general environment. The struggle for conscientious business owners is how to ensure that these all match for the brand and for your consumers, as well as your own personal story. What is good for your company is often not good for the environment (e.g. elaborate and beautiful plastic containers), so you have to push on innovation and sometimes you must work hard to find that middle ground. Or perhaps your target audience is tightly focused on sustainable packaging, but it’s a struggle to find a large enough market when your packaging isn’t flashy (endangering your business potential). Or perhaps you’ve learned that one rare ingredient is amazing for skin, but it comes from an endangered tree far away (damaging the environment). Whatever the equation you’re trying to balance, it will almost certainly mean compromises and education for your customers about your choice. The growing trend towards natural and organic skincare is one we’re excited about since it increases personal and environmental stewardship. However, this growing trend itself is stressing the environment. Organic does not always mean sustainable, simply because it takes more land acreage to grow organic crops without the help of pesticides and other efficiency-raising, non-organic strategies. And many natural non-organic (aka conventional) ingredients come from non-sustainable sources, further stressing our environment. Organic crops not only usually require more land as compared to their conventional counterparts, they often require more water. Because demand for organic ingredients has skyrocketed in the past few years, major stress is being placed on the land and our water supply. Simply put, the land can only grow so much of a crop without endangering the earth’s delicate balance. While some amazing research by scientists is being done to reduce water use for feeding crops, and using green chemistry, the success is not yet there, so we must do everything we can in the meantime to help Mother Earth. We understand most people prefer to put natural products on their skin. We are not against this, but we also believe in the power of nature-identical, lab-created compounds, especially when the natural ingredient is actually toxic or not sustainable. Scientists have long had the capacity to synthesize molecules that are identical to those found in plants, providing the same effects and benefits. It will taste the same, smell the same, and it will function the same in your body.We are happy using these on our own skin, and as the rise of sustainable beauty takes hold there will likely be no choice but to embrace these nature-identical compounds. When we are out in the sun and our bodies make Vitamin D, the vitamin is considered to be natural. But the exact same compound made in factories that you can purchase as a vitamin pill is considered to be synthetic. This is because the compound from a natural source is not sustainable, however the chemical molecule appears to be exactly the same. Most iron oxides used in cosmetics are synthetic. The iron oxides used are mined from iron salt mines and then oxidized in a controlled laboratory setting where they are purified for cosmetic use. Iron oxides that are made in uncontrolled natural settings are often contaminated with heavy metals like mercury. It should be noted that often natural is not as safe as synthetic. Everything, including water (also know as dihydrogen monoxide) is a chemical, so it’s about knowing what type of chemical something is rather than immediately understanding or being scared by a lengthy name. Lab-created nature-identical is the only way to manage certain resources as populations continue to boom. Thus we find a new movement towards clean beauty, rather than just natural or organic. Molecules can still be safe even when synthesized in a lab. We’ve discussed personal sustainability and that of the environment. But what about your business? Keeping your customers educated about the ingredient choices you make, and why, is a great place to start. Pivoting away from just natural and organic beauty will be a slow process, but one that can’t be ignored as the health-conscious beauty movement continues. Reduce packaging. Does your product need to be in such a small size? Larger containers often reduce waste. Do you need a retail box? Can you alter the display to minimize waste? Use recyclable packaging and supplies. Cardboard and thinner plastics are appearing more frequently. Perhaps a shampoo or lotion bar would fit well with your line. Refill packaging from customer drop sites. This can be trickier with FDA guidelines (and we have run into this issue), but if appropriate and safe consider letting customers return used packaging for you to refill for them. Invest in or donate to renewables and sustainability-focused organizations. There are hundreds of reliable and accredited organizations causing measurable impacts. Consider ensuring reputability on charitynavigator.comand then make a commitment that’s visible to your customers and helps tell your brand’s story. At Essential we do our best to adhere to these suggestions, including making regular donations to a variety of environmental groups and keeping sustainability in mind at every step of the way. We have planted hundreds of trees, sequestered over 10 tons of carbons and worked to save sea-grass habitats, use carbon-offset shipping and maintain our large array of solar panels. We’re so grateful to have a community that cares and helps us achieve these goals. As we work towards both clean and sustainable beauty, we’d love to hear what it means for you and your brand. How do you integrate sustainable practices into your business? Sign up to receive Essential recipes, exclusive offers, blog posts and industry tips! Q. Can I sell Essential’s products in my salon? Q. Have you changed your formulas? There are new ingredients listed in many products. Q. Why don’t you sell Dead Sea Salts? Q: Can I Get my Label on your Skincare Sample Sets? Q: Can you Recommend Packaging for Products with Essential Oils? Q: Essential Wholesale is proud to announce that we are now a Leaping Bunny certified facility! What does that mean for us and for you? Q: Why can’t I see my product review on your website? Q: Why is Essential no longer accepting returns? See the full list of customer questions and our answers.